Theresa Hitchens wants to make the world safer. She's director of the UN Institute for Disarmament Research, but one of her biggest concerns floats above national boundaries. She told io9 about the growing dangers of orbital space debris, and the obstacles standing in the way of cleaning it up. Previously, Hitchens was director of the Center for Defense Information in Washington, D.C. and led its Space Security Project. But as she told us when we caught up with her in Geneva earlier this week, the problem is that we haven't even got a decent legal definition of "space" — let alone a plan for dealing with dangers from beyond the boundaries of our atmosphere. io9: How bad is the current situation? Theresa Hitchens: Space debris is a serious problem, particularly in the heavily used Low Earth Orbits (LEO). As of 2013, NASA estimated a population of 500,000 pieces of space debris (between 1 and 10 cm in diameter); some 21,000 pieces of which are larger than 10 cm. Unfortunately, NASA estimates that there are more than 100 million pieces of debris smaller than 1 cm that cannot be seen. U.S. space tracking facilities can only routinely see pieces of a certain size: in LEO, about the size of a softball; in Geosynchronous Orbit (GEO), where most large telecommunications orbit, down to the size of about a basketball. Even more unfortunately, a piece of debris the size of a thumbnail can do serious damage to a satellite, due to the high speeds at which objects travel in space and the resulting impact velocities. 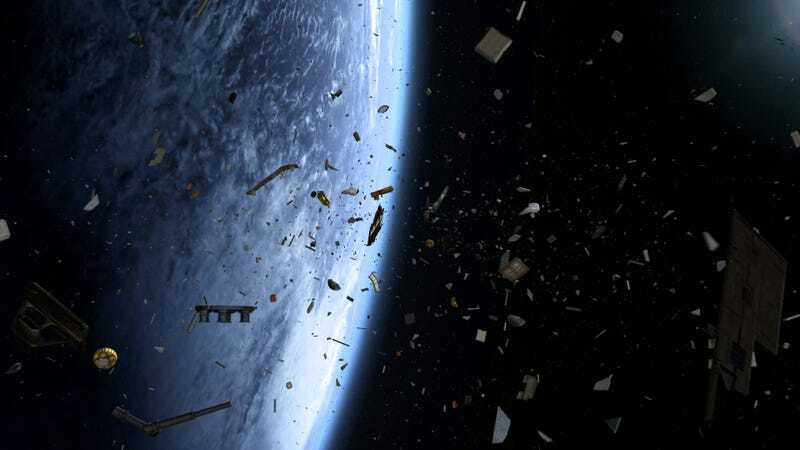 As such, debris represents a standing danger for all space operations (there are an estimated 750 active satellites currently in orbit), including the International Space Station. Indeed, the ISS is forced to maneuver out of the way of potentially dangerous debris on average at least once a year. There are also considerable concerns about the potential for a "chain reaction" or cascade effect of a collision between space objects releasing considerable debris that subsequently crashes into other debris or satellites, which could wreak havoc on satellites and other space objects. This is know as the Kessler Syndrome, after the scientist, Donald Kessler, who first discovered the potential problem in 1978. This is essentially what you are seeing when you watch the movie Gravity, although Hollywood took a lot of poetic license. Rather than being a rapid impact event, like in Gravity, the cascading of debris would happen slowly over time—and it is currently a problem mostly limited to LEO. Indeed, Kessler himself believes that the cascade has already been underway for nearly a decade. He predicts that while the average time between collisions in space is currently 10 years,; within 20 years it could be down to just five years. That means LEO, in particular, could be unusable in a 100 years time. NASA is worried enough about this to already be funding various concepts for removing debris from LEO (it's harder up higher and pretty much impossible in GEO, where the recommendations on debris mitigation approved by the UN recommend "boosting" dead satellites into higher orbits to get them out of the way of working satellites). There have been some suggestions that the UN Committee on the Peaceful Purposes of Outer Space (COPUOS) began studying on how an international effort linking national space agencies might begin to work on so-called "active debris removal" technologies. As of now, however, there is no such thing as a Space Hoover. What are some of the legal obstacles to reducing space debris? There are two facets to handling debris. One is debris mitigation—that is, methods and practices to reduce the amount of space debris created with each space launch. On this front, there has been considerable progress at the international level. The United Nations General Assembly in 2007 endorsed a set of space debris mitigation guidelines that were put together by the COPUOS. While these are not legally binding, UN member states are pledged to follow those guidelines and encouraged to "legalize" them through national legislation. The second issue is debris removal. That is whether the legal kettle of fish gets very large. The primary obstacle is that the Outer Space Treaty of 1967—sort of the Magna Carta for space—declares that all space objects, including non-functioning satellites and debris, belong to the country of launch. So a would-be Space Garbage Collector would need the permission of the launching country to remove or otherwise interfere with any given piece of space debris. To further complicate matters, most space debris is small and old, and it can be quite difficult to classify it as belonging to any one former space craft or launcher. Don't even get me started on the Liability Convention, which governs how liability is assigned for accidents in space or involving spacecraft and rockets. Suffice to say that a zillion lawyers will be dancing on the head of that particular pin for sometime. Do some of the proposed technologies for removing space debris pose dual-use concerns? The short answer is yes. In fact, pretty much any technology for removing debris could be used to take down a satellite under hostile circumstances. This is one of the reasons that many in the space community believe such activities will require a multilateral development approach and an international governance structure. Does space debris pose any risks to international security? Yes. Given that most space-faring countries do not have the ability to track space debris—the U.S. has the most sophisticated capabilities, followed by the Russians and to a lesser extent the EU— it is highly conceivable that, in a time of crisis, if there were a collision between a piece of debris and a working satellite and the satellite went belly up, then the owner government of the satellite might conclude that it was a deliberate act. Satellites serve national security purposes as "early warning" systems for potentially hostile acts on Earth (monitoring nuclear weapons facilities, troop movements, etc.) and as force multipliers in a conflict. So it is not surprising that military strategists would see them as potential targets in a conflict. Indeed, and unfortunately, several nations are known to be actively exploring satellite destruction capabilities. The U.S., Russia and China have tested kinetic energy (non-explosive) anti-satellite weapons; India is considering it. Several nations are experimenting on capabilities for docking with non-cooperative satellites—those not specially developed to docked with—for activities such as repair and refueling. These technologies could just as easily be used to harm a satellite. In a future era where everyone is armed to the teeth with anti-satellite capabilities, the likelihood of a debris strike being mistaken as a deliberate strike by an enemy skyrockets. It would be a very unstable situation, prone to miscalculation and crisis escalation. In my humble opinion, this is why the development and deployment of overt anti-satellite weapons systems would be a mistake. There is enough latent capability (going back to the dual-use issue) currently inherent in the space programs of major space-faring powers to be concerned about miscalculation; we don't need any more fuel for possible flames.